We have been growing seed potatoes for many years. We now specialize in producing high grade Maris Peer and Charlotte seed but will also be growing selected other varieties. Please look at the SASA seed register for details or contact James with any enquiries that you may have. We grow our seed in Easter Ross. Its northerly location and kind climate provide excellent growing conditions with a low incidence of disease and virus. Weekly inspections by ourselves and an Agronomist are carried out throughout the growing season in order to maintain crop health. 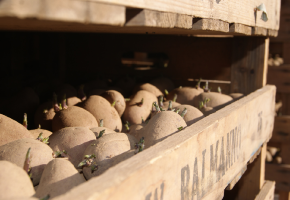 Once lifted all stocks are immediately put into cold storage to ventilate and cool the crop until graded to order. All seed can be supplied to your individual specifications, please contact us with your requirements.